With its Launch Readiness Review complete, Arianespace continues to make preparations to launch its first Ariane 5 rocket of 2017. The delivery into space of two communication satellites, SKY Brasil-1 and Telkom 3S, is scheduled for the beginning of an 86-minute launch window that opens at 4:39 p.m. EST (21:39 GMT) on Feb. 14, 2017. The mission, designated VA235, is being flown to deliver the two satellites to geosynchronous transfer orbit (GTO). The European heavy-lift vehicle is notable in its capability to deliver multiple, large satellites into orbit, allowing customers to share launch costs. The 13,228-pound (6,000-kilogram) AT&T/DirecTV SKY Brasil-1 spacecraft will supply digital entertainment services to Brazil via DirecTV’s Latin America subsidiary. Sharing the ride to GTO inside the fairing will be the 7,826-pound (3,550-kilogram) Telkom 3S digital services satellite. The state-owned Telkom Indonesia satellite will provide telecommunications and high-definition television services throughout the island nation. Riding in the lower bay of the two-position SYLDA payload carrier is the Telkom 3S satellite. The third Telkom satellite to be launched by Arianespace, it was built on the Thales Alenia Space Spacebus 4000B2 platform and is outfitted with 24 C-band, eight extended C-band, and 10 Ku-band transponders. Telkom 3S will ultimately be positioned at 118 degrees East and will provide a multitude of digital services to customers in Indonesia, Malaysia, and Southeast Asia. The medium-class satellite has twin solar arrays, providing the necessary 6.3 kilowatts of payload power, and has an expected on-orbit lifetime of 15 years. 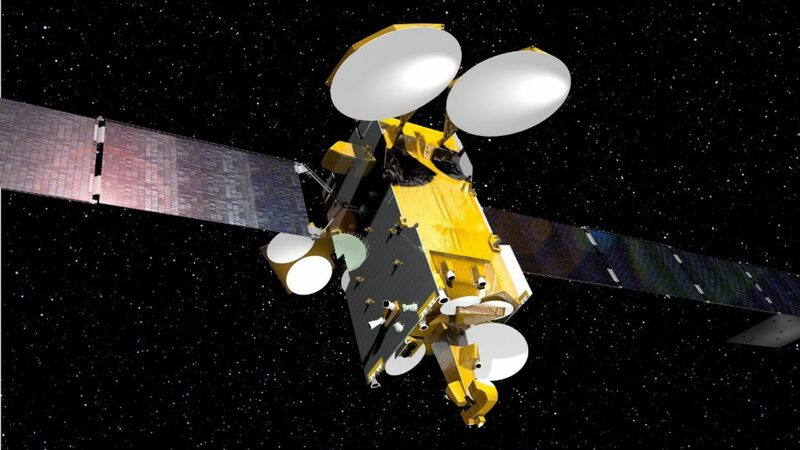 The other satellite, SKY Brasil-1, will sit in SYLDA’s top position. Alternately known as Intelsat 32e, the satellite was built on the Airbus Defense and Space Eurostar E3000 spacecraft architecture, a widely used and flexible satellite bus. Using its 60 Ku-band transponders, the satellite will provide services to Brazil and areas of the North Atlantic Ocean. After settling into its orbital slot at 43.1 degrees West, SKY Brasil-1 is expected to deliver digital content for at least 19 years. Arianespace’s reliable Ariane 5 rocket will be delivering the satellite duo to GTO. It is configured in its ECA arrangement for flight VA235. The heavy-lift rocket has been a mainstay of the multinational launch provider and offers a high degree of precision with its ability to place payloads into orbit with near meter-level accuracy. Like NASA’s now-retired Space Shuttle, the Ariane 5 makes use of solid-fueled boosters to supplement the main liquid-fueled engine. A pair of P241 solid rocket boosters will provide a combined 3.18 million pounds (14,160 kilonewtons) of thrust at liftoff. 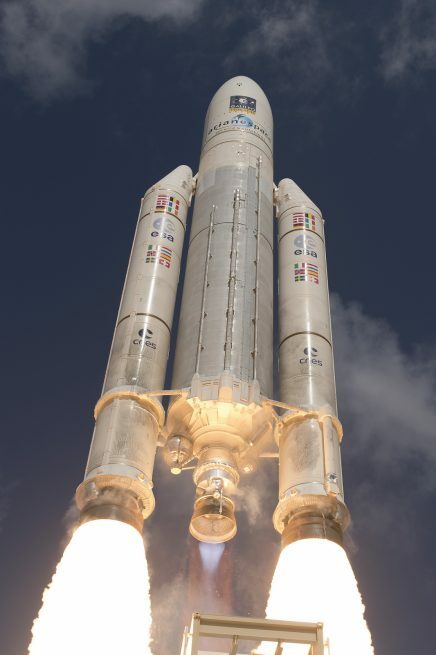 Each will burn for approximately 130 seconds, providing roughly 92 percent of the Ariane 5’s liftoff thrust. Once their propellant is consumed, they will separate and fall into the Atlantic Ocean. Supplying the remaining eight percent of liftoff power is the core stage’s Vulcain 2 cryogenic engine. Burning a mixture of liquid hydrogen and liquid oxygen, the hydrolox powerplant provides 220,000 pounds (960 kilonewtons) of sea-level thrust. That increases to 310,000 pounds (1,390 kilonewtons) as it climbs into the vacuum of space. The second stage is outfitted with a single HM7B cryogenic engine. It supplies 15,000 pounds (67 kilonewtons) of vacuum thrust and can operate for 945 seconds. The mission will be broadcast live via Arianespace’s website. Coverage will begin 15 minutes before the scheduled liftoff.